In 2019, CLC-K Boxed Lunch event delighted the Chatham-Kent community serving over 3,100 box lunches. The participation of community members is a testament to the generosity shown in Chatham-Kent! This year, we supported 11 local schools who have many children who are not able, for one reason or another, to bring a lunch to school every day. In Chatham-Kent, the school nutrition programs service approximately 9,000 children by providing anything from a small snack to a full lunch. 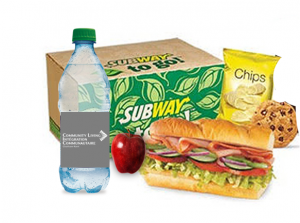 So, CLC-K and Subway partnered with our community to be able to offer 1,555 lunches on March 7th. A sincere thank you to North Kent Wind, South Kent Wind, TekSavvy and First Choice Building Restorations for supporting this program! Together they provided 768 lunches towards this new program. Come back in 2020 to order again!